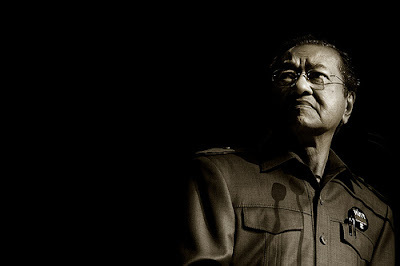 Many of those who worship Tun Dr Mahathir cannot understand why Malaysians blame TDM for the woes of the country. I have compiled excerpts of articles published in the media in past years to refresh the memories of Malaysians, as to why many Malaysians feel TDM did more bad than good for the country in his 22 years. 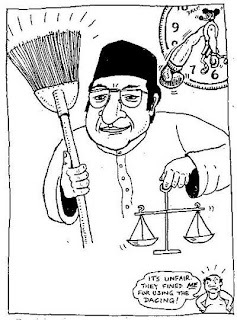 You came to power in 1981 and introduced the slogan Bersih, Cekap dan Amanah (Clean, Efficient and Trustworthy). What did you do to further that? Did you make the Anti-Corruption Agency more independent and effective? Did you ensure that the police and judiciary did their jobs properly and reduce corruption in their ranks? Did you censure ministers and chief ministers who received incomes beyond legal means? How many big guns were prosecuted for corruption during your tenure? What happened to Bersih, Cekap dan Amanah? Your criticism of the government got plenty of coverage in the local media whereas, during your time, criticisms against you by two former prime ministers were muted in the mainstream newspapers. Editors in Umno-linked newspapers too were removed for not toeing the line. What did you do to advance the cause of responsible press freedom? You went ahead with the national car project in 1983 despite a number of experts disagreeing with you, especially with respect to the lack of economies of scale. Isn’t it true that Proton’s profits over the past 20 years came from the vastly higher prices that the Malaysian public have had to pay to subsidize Proton, resulting in considerable hardship for Malaysians who need cars because of the poor public transport system? Why was it necessary for Proton to buy a stake in a failed Italian motorcycle manufacturer when it could not even produce cars competitively? Why did you push into heavy industries such as steel and cement in the 1980s, ignoring studies which suggested developing natural resource-based industries instead? They caused major problems and billions of ringgit in losses. Why did you allow hordes of people to immigrate, mainly from Indonesia, in such an unregulated way that there are as many or more illegal immigrants than legal ones now, accounting for some two million or more people? Did you not realize that this would cause serious social problems? Why did you have to resort to this move in October 1987, when you used the Internal Security Act to detain over 100 people, close down four newspapers and cause a wave of fear throughout the country? Was it to consolidate your tenuous hold on power then by using an oppressive law? What motivated you to take action in 1988 to remove the then Lord President and several Supreme Court judges from their positions under allegations of judicial misconduct, a move which was heavily criticized by the Bar Council and other bodies? Was it because you needed more compliant judges whose rulings would not threaten your position of power in a number of cases in court? Was this the first step in dismantling the judiciary’s role as a system of checks and balances against the legislature and the executive? What have you to say to repeated assertions by many, including prominent ex-chief justices, who maintain that this led to the erosion of judicial independence? Why did you allow our national school system, which is the ideal place to develop ties among young Malaysians, to become so divisive? Why is it that our local Universities, once the preferred choice of tertiary education, have deteriorated to a level that even students who have gained admission prefer to enroll in local private colleges and universities? Why did your government sell MAS (privately) to Tajuddin Ramli who had no knowledge whatsoever about running an airline? Why did your government then later bail out Tajuddin by paying RM8 per share when the shares were trading at only RM3.60 in the open market, costing close to RM 1 billion of the rakyat’s money. Why did you allow privatization to take place in such a manner that the most profitable government operations were sold away like Telekom Malaysia, Pos Malaysia and Tenaga Nasional? Toll concessionaires were guaranteed toll increases and compensations in the event traffic projections were not met. Independent power producers had contracts that guaranteed profits at the expense of Tenaga Nasional. What was the justification of privatizing the government medical stores to Southern Task Sdn Bhd, and the resulting increase of prices of medicines? What is the justification for spending RM20 billion on a grandiose government city at a time when there was a glut of office space in Kuala Lumpur? Could the money not have been put to better use, such as improving educational resources? What was the basis of granting Indah Water Konsortium a concession to manage the national sewerage system? Can you explain the RM1.4 billion soft loan to IWK which has suffered irrecoverable losses? Why did you rescue Konsortium Perkapalan Berhad (then owned by Mirzan Mahathir) and which had debts of RM1.7 billion using funds from Petronas? Was it not your administration which forced Malaysian International Shipping Company (MISC) to acquire the assets of Konsortium Perkapalan Nasional? Why did your administration bail out Time Dotcom Bhd which was saddled with a RM5 billion debt? Why did your government use RM904 million from Kumpulan Wang Amanah Pencen to buy up 273.9 million of unwanted Time Dotcom shares incurring an instant loss of RM280 million? Did you not force the Employees Provident Fund (EPF) to buy 81.6 million unsubscribed public portion of the initial public offering (IPO) of Time Dotcom Bhd at RM3.30 per share when the shares were trading at only between RM1.95 and RM2.10 and in the process incurring an instant loss of RM100 million? Why did you bail out the light rail transit operators Projek Usahasama Transit Ringan Automatik Sdn Bhd (PUTRA), which belonged to Renong; and Sistem Transit Aliran Ringan Sdn Bhd (STAR) using almost RM600 million from EPF, which still resulted in EPF having to write off RM135 million with a share loss of RM96 million? Why did your administration award the North-South Expressway concession to UEM (who then formed Plus) and then provide them with a loan of RM1.6 billion which was half of the tender price of RM3.2 billion. What was the justification for your administration to grant Plus such overgenerous terms, which included annual increment of toll rates and guaranteed traffic volumes? Why did your administration in 1998 award a RM24.3 billion contract to PSC Industries Berhad, together with an advance of more than RM2.5 billion to build naval patrol boats? Why were they also given exclusive rights to service the Malaysian navy’s entire fleet? Could you confirm that the first two ships built by PSCI could not even pass pre-delivery trials? How would you answer to the Public Accounts Committee’s revelation that it will cost the government another RM120 million just to salvage the first two vessels nearing completion after seven years? Why did you award Ekran Bhd the contract to build the Bakun Hydroelectric Dam in Sarawak? Why did your administration take over the construction of the dam by bailing out Ekran by almost RM200 million for ‘work done’? 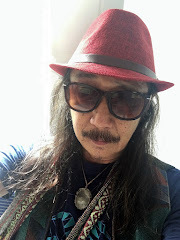 What was the basis of inviting Libyan-American Sadeq Mustaffa to Malaysia to set up InventQjaya Sdn Bhd and to also give him a grant of RM440 million? What was the benefit for Malaysia and how has Malaysia benefited? What has happened to InventQjaya now? Why did your administration dabble in the money market which ultimately cost Bank Negara almost RM9.3 billion in losses? Why did you allow the mismanagement of Bank Bumiputra, to the extent that it had to be bailed out 3 times, costing the country a total of RM 3 billion? Again, dipping into Petronas’s funds? Why did your administration allow Perwaja Steel to be mismanaged resulting in RM 2.9 billion of the rakyat’s money being squandered? There you are, 22 fiascos in 22 years. The bad news is that there are actually more than 22! Remember the APs, Maminco, Renong and many more. Those who remember, please add on to this list. P.S. 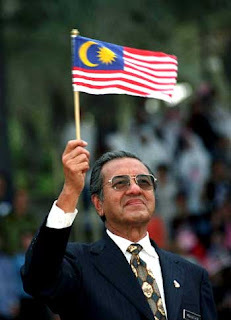 For me Mahathir's greatest crime was that his megalomanic ambition totally obscured the Horizon of Decency. A lot of young Malaysians growing up during the Mahathir years seem completely clueless about ethics. This is particularly true of a large segment of Melayu Baru (members of Mahathir's Umno Baru, no doubt) - who got disconnected from their original graciousness, patience, and openness of heart - and became arrogant, jingoistic, ruthless and rapacious big-time wannabes. 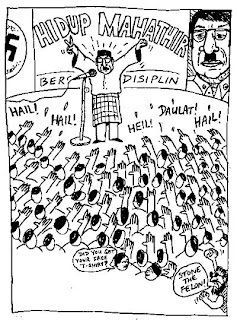 Indeed, Mahathir's influence was so all-pervasive, even minibus conductors and office clerks turned into Little Napoleons during those dark days under the Incurable Dr M! 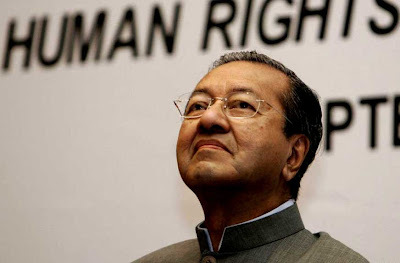 *I have just been informed that "Batman" may have rehashed his article from an original feature - Question Time: 22 Questions for Mahathir - by P. Gunasegaran, published in The Edge. RM 2.9 million or RM 2.9 billion? 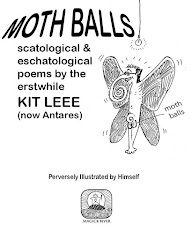 I also wanted to say something about mr chebet.com wanting to promote mr C4,but i ain't no martyr like rpk. Mr chebet was an "India" when he applied to join University of Singapore. He destroyed UMNO and when he founded his "UMNO Baru", he put down "Melayu". I am sorry that few "India", if any, were sorry to see the back of him then or when Pak Lah took over. Put simply you cannot believe a man who lies about his race. Got add 1 more lah ... when the whole world was trying to control population growth, MM decided to leap frog Malaysia' population growth by getting people to have 5 kids !! Some even took it further, why stop at 5? Over an above the increase through natural birth, we have instant mass growth whereby whole bodies were instantly delivered through a stroke of the administrative hand. Now, with the fuel price explosion - our social problem could be multipled many folds. The bulk of the nation's wealth went to Britain as the British still controlled most of our country's wealth, i.e. tin and rubber. The Chinese came to Malaya more than 1000 years ago, while the Indians came here almost 1030 years ago. 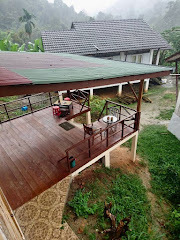 Kota Gelanggi and Lembah Bujang are proof of these early settlements. I chose NOT to moderate comments on this blog and so whatever anybody says will immediately appear online - however I reserve the right to DELETE what I regard as repugnant comments. So far the only comments I've deleted have been spam. 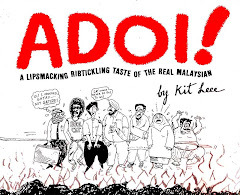 Today I have SEVERAL commenters using this blog to vent their extreme hate & prejudice against Malays. What's even more objectionable their attacks are couched in the crudest of terms. I do not endorse and will NOT tolerate anyone spewing such unmitigated HATE here. If anyone happened to read these nasty comments before I could delete them, please accept my sincere apology. Those comments have now been trashed because they serve no purpose except to allow somebody the chance to let off some steam.